An array of talent will come together for an evening of poetry, prose and music to raise money for Falkirk Foodbank. ‘Home Game’ is at Behind the Wall tonight (Thursday) when acclaimed film maker and musician Adam Stafford will make his first visit to Falkirk in over two years alongside big name poets and writers. Created by Craig Allan from Untitled and Gordon Johnston from Glasgow publication The Grind, ‘Home Game’ will feature CD Shade, Samuel Best, Cee Smith, Hannah Fyfe, Stephen Watt, Bethany Ruth Anderson, Dickson Telfer and Falkirk’s emerging talent and Woo’er with Words favourite Paul Cowan. 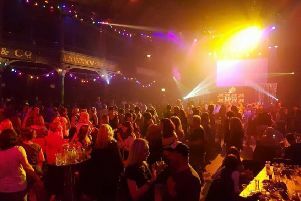 Craig said: “We’ve run smaller, regular events for the foodbank in the past, but now we’re working with The Grind to put on a much bigger event. “It’s also great to have Adam Stafford returning to Falkirk, and Falkirk Library will also be there as part of Scottish Book Week. “This will be a fantastic charitable night of spoken word. “All proceeds will go to the local foodbank as a gesture for the great work they do. Tickets for ‘Home Game’ also include an exclusive invite to the national launch of Dickson Telfer’s second collection of short stories, ‘Refrigerator Cake’, published by Fledgling Press. Dickson will be reading from his new book and copies will be available to buy on the night. ‘Home Game’ will be headlined by Falkirk’s multi award-winning musician and film maker Adam Stafford. The former front man for indie stalwarts Y’all is a Fantasy Island, Adam’s solo album ‘Imaginary Walls Collapse’ was longlisted for the distinguished Scottish Album of the Year in 2013. Tickets for the event, priced £5, are available at the door on the night. The launch of ‘Refrigerator Cake’ is a free event, beginning at 6.30 p.m., with ‘Home Game’ starting at 7.30 p.m. and going on until 10 p.m.